Targeted Traffic: Techies, Early Adopters, those interested in cellular products and services. Ads: Currently we are offering 125 pixel x 125 pixel in our side bar on a per month basis. The per month cost is $50. If you choose to purchase this ad by the year you pay only $500 you save $100! Your advertisement will also recieve mention in email updates. These updates occur Monday - Friday everyday, and some Saturdays and Sunday (randomly). If you are interested in purchasing advertisement you may do so by emailing me at kallandahn@gmail.com. 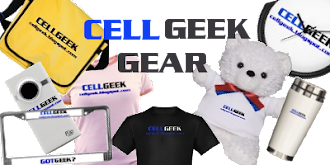 CellGeek does not accept adult oriented advertisements. Please keep your ads clean, and family friendly.